Oakmont, Massachusetts is drowning. Fully half the city has been abandoned to the sea, bustling city streets now replaced by rivers, winding between the sagging wooden edifices of lost storefronts. Problem is, I need to get into one of those shops. A diving crew’s gone missing, the only known survivor’s gone mad, and I’ve been charged with finding out whether the rest are alive or not—and the workshop that made diving suits is on this block somewhere. Sighing, I clamber into a nearby rowboat and hope that the top levels have survived relatively unscathed. I’ll tell you what, Sherlock Holmes never had it this rough. The Sinking City is more ambitious than I imagined. When the project was announced—back when it was still a Call of Cthulhu game—I expected developer Frogwares to turn out one of its Sherlock Holmes games with a cosmic horror bent. And that would’ve been fine! The Sherlock Holmes games all follow the same basic case-by-case structure, but they’re (with the exception of 2016’s Devil’s Daughter) also fairly enjoyable detective games. Easy, but enjoyable. Frogwares has quietly come into its own though. Writing about Crimes and Punishments in 2014, I said the Sherlock Holmes games had gone from guilty pleasure to “legitimately good,” in part because of improvements on the technical side. Devil’s Daughter was by-and-large disastrous from a story and structure standpoint, but continued to push for larger and better-looking environments. And in The Sinking City that process culminates in an enormous open-world, with crowded city streets and seamless interiors. It’s nothing we haven’t seen before, but it’s definitely something we haven’t seen from Frogwares before. The effects are far-ranging. I had the chance to go hands-on with The Sinking City for about two hours last week, and I should caution up-front: They wanted me to stick to the main storyline for the demo. There are a ton of side-missions, some of which I saw hints of during the demo. You can tackle these in any order, simply by following rumors to a location on the map. But how long they are? How involved? I don’t know yet. We went straight through the first two cases in the game though: The disappearance of local politician Robert Throgmorton’s son and then the aforementioned diving expedition. And even without wandering off in search of side missions, the open city influenced these cases in myriad ways. 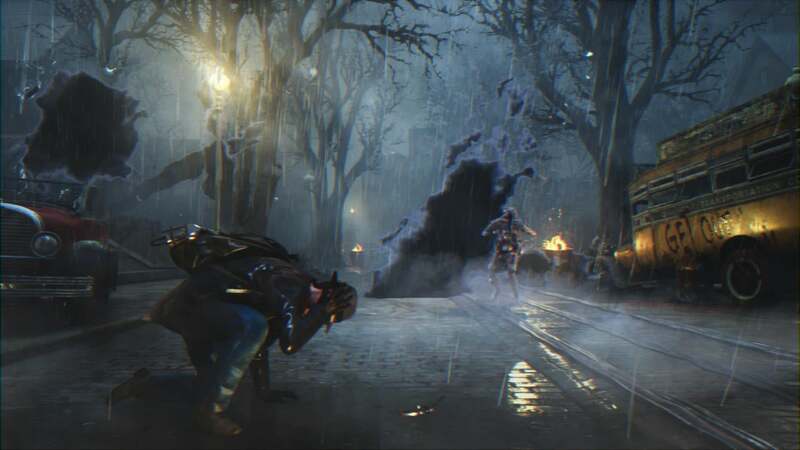 The Sinking City is loathe to tell the player where to go, for instance. You’ll (very) occasionally get a quest marker, but often you need to pay attention to verbal directions or infer your next destination from context. The first case, Throgmorton told me his son had washed ashore in a rowboat. Asked where that happened, he told me to face the door of the warehouse, then head left until I found a fenced-in beach. That was it. No quest marker, nor even a point-of-interest marked on the map. I just had to walk. The rowboat contained a vital piece of evidence, and I’m not sure what would have happened if I missed it—assuming The Sinking City allows you to miss it. I didn’t get to test that hypothetical either. Regardless, it’s neat to play a detective game that doesn’t hold the player’s hand all the time. Told to head to a local dive bar, I had to wander the docks until I found it. Another locale indicated a wounded man fled the crime scene, and I inferred that I should head to the hospital. Once there, I had to ascertain which of the new arrivals seemed most likely to be lying about an axe wound to the shoulder. And in the case of the diving suit I was told the shop’s cross-streets, enough to place my own marker on the map. The Sinking City shines in these moments. You feel like an actual detective, crisscrossing Oakmont in pursuit of various leads, each clue revealing the existence of others until you can chain together a full account of the crime. It’s those Sherlock Holmes games, but on a much larger scale. The second case in the game took me upwards of an hour to complete and involved the local newspaper, an adventurer’s society, a fight at the docks, the hospital, the diving suit warehouse, a brief underwater section, and a large undersea cavern and/or temple. Cthulhu fans know what’s coming. Anyway, I’ve listed seven distinct locations there, each with clues to the case and the world itself. 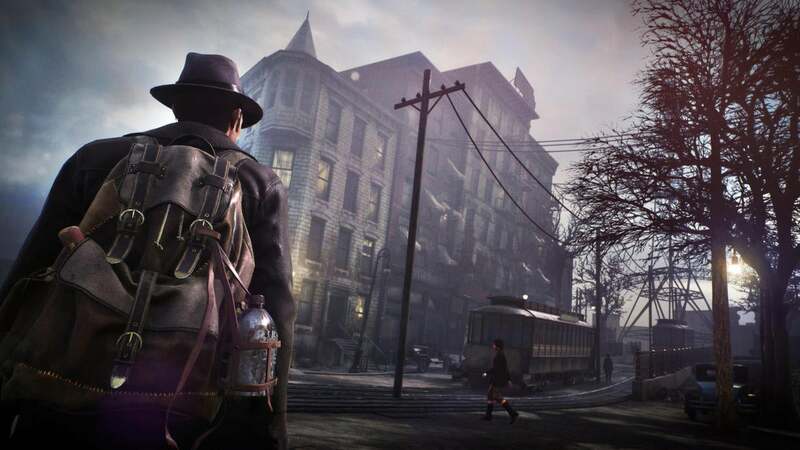 Unfortunately the crime scenes are a bit more rote—the points of interest are usually pretty obvious, and The Sinking City tells you when you’ve found every clue in an area. It feels a bit like Murdered: Soul Suspect I think, which is disappointing considering how subtle The Sinking City is at other times. But as I said with the rowboat, I’ll be curious whether the player can miss entire investigation areas and thus miss out on crucial evidence. That could be a neat twist. Frogwares also brings back the Sherlock Holmes deduction web, which allows you to come to improper conclusions about evidence. And on top of that, there are a number of choices to be made about your conclusions. In the first case I cornered the killer, but he claimed he’d been possessed during the murder. He also offered a bribe, if I looked the other way. My options? Turn him in to Robert Throgmorton, or don’t and take the bribe—or take the bribe, then turn him in. 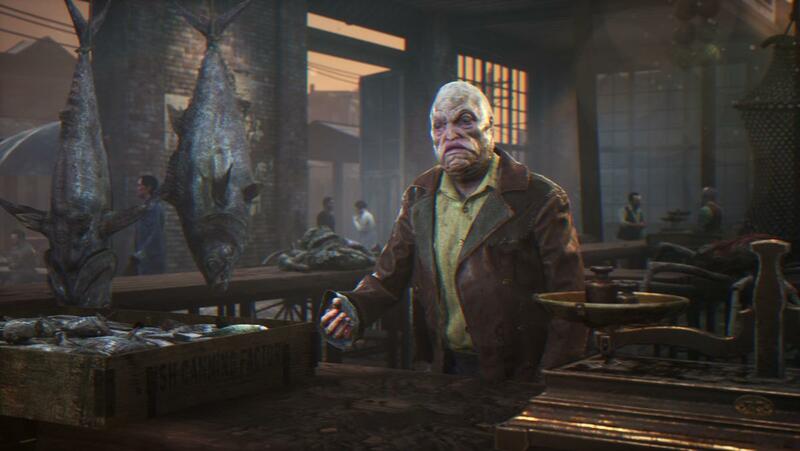 It seems like The Sinking City is setting up for some fairly complicated faction storytelling, with the Throgmortons and their political strength on one side and the Innsmouthers—fish people, in classic Lovecraft tradition—on the other. I’m looking forward to seeing how that plays out too. Again, it’s very ambitious compared to what Frogwares has done before. Not that all the rough edges have been sanded off. There was some shooting in my demo, basic combat against skittering spider-like creatures. That aspect wasn’t very inspiring, and I’m hoping it doesn’t become a major part of the game going forward. Your character also hallucinates when his sanity meter drops, a la Call of Cthulhu: Dark Corners of the Earth, but early in the game this system hasn’t seemed very important. There was one good moment where I shot one of those nightmare-spiders, only for it to disappear in a puff of smoke, a figment of my imagination. That was an outlier though. Most of the time my “insanity” manifested as grainy images of our poor private investigator protagonist hanging from a noose, which was grisly but not very interesting or surprising. 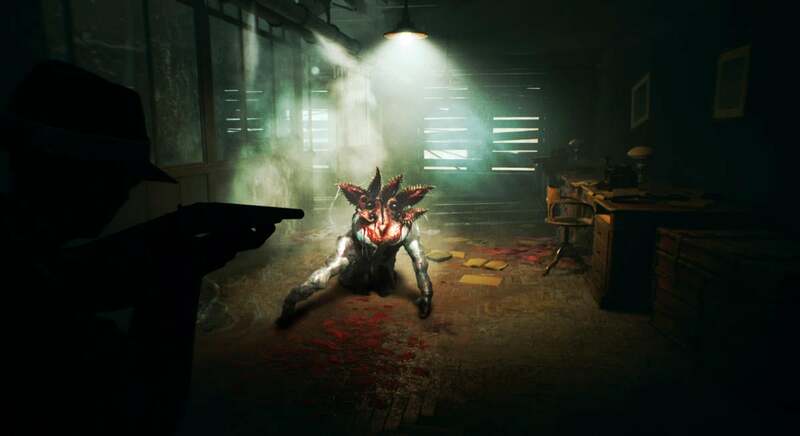 Here’s hoping The Sinking City can reach the heights of cult favorites like Dark Corners of the Earth and Eternal Darkness. I’ve been looking forward to The Sinking City for a while though, and getting hands-on time only made me more excited. Nobody else makes detective games on this scale. There’s bound to be some jank around the edges, but if Frogwares can nail the core cases and make good on its more open structure I think The Sinking City will be something special. As I said, Frogwares has certainly come into its own over the last few years. Impressive.